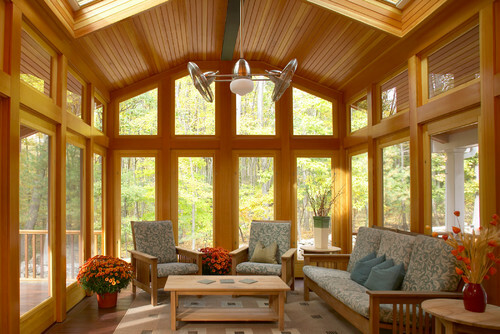 It's been widely reported for years that ceiling fans help with energy bills, circulating heat and cool air in living spaces. In recent years, they also (like light bulbs and appliances) have become more energy efficient. Older ceiling fans consumed 100 watts to run the motor, many newer ones need only 49 watts. 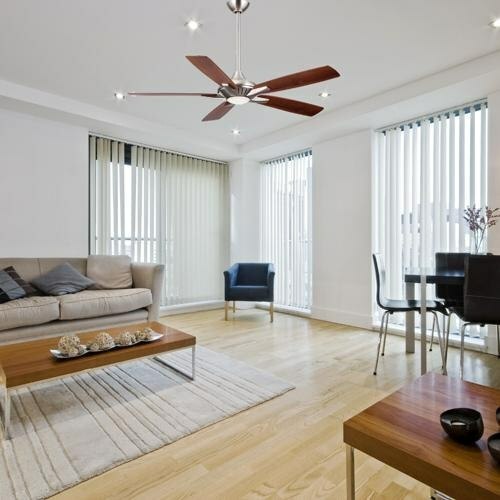 Another great improvement is that, many lights on fans are LED, a wonderful benefit for a fan on a high ceiling. LED light bulbs have an average 22 year life span, so you do not have to reach up and change the bulb as often. 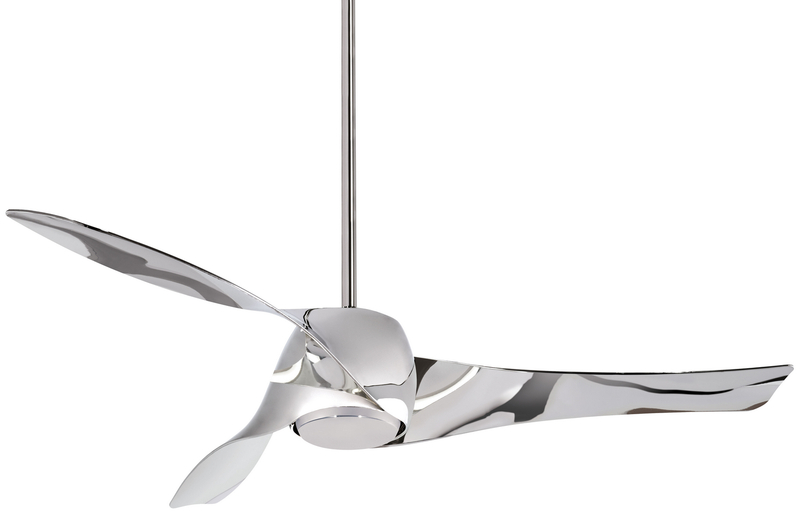 In this article, we'll go over one of the most popular finishes for ceiling fans, brushed nickel, and feature some of our favorite brushed nickel fans. Fans are available in a large variety of styles, from the utility fan to the conversation starter, but the most popular finish is brushed nickel. This finish is similar in color tone to grey, one of the most common neutral tones in decorating. It’s also a softer color than bronze, especially on a white ceiling. Brushed nickel has become especially popular because it works well in kitchens with stainless steel appliances. 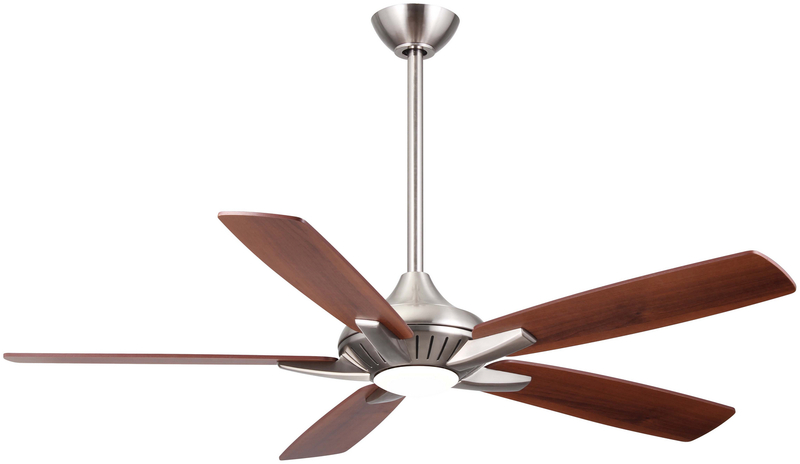 You should consider brushed nickel as a design element instead of the typical white fan. Following are five great options of all different styles along with application photos. The light has 1,100 lumens, equivalent to a 100 watt bulb, but rated to last 30,000 hours. It is contemporary, but without the hard edges. 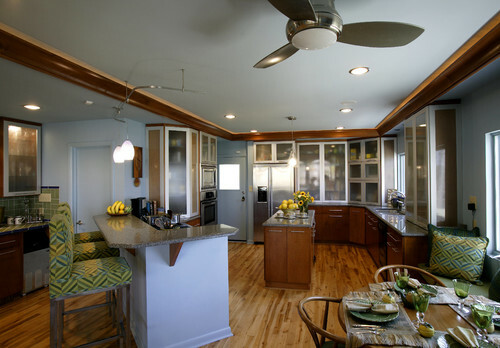 It's hard to believe there are very few fans surface mounted for shorter ceilings. This could be the best selling fan in the country for shorter ceilings. Can be hung with or without the light. This is truly a hard working fan with a decent blade pitch for moving air, ideal for very large spaces and very high ceilings. High performance twin turbo fans which can run while the whole fan turns- produces a massive amount of wind. Its unique look makes it a real eye catcher. A 100 watt halogen light provides a lot of light, and the fan also has a cover for non-light use. 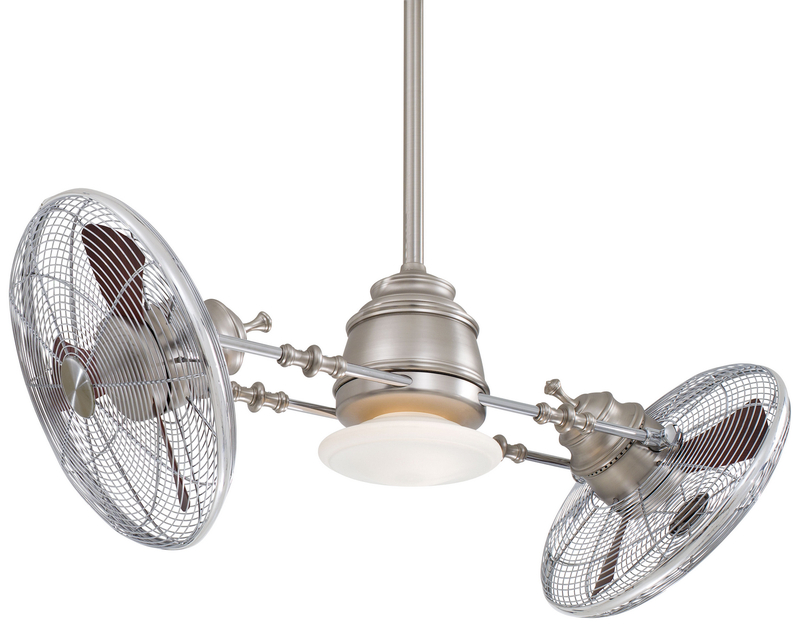 A stunner of a fan, and because the blades sit vertically, it will move a tremendous amount of air. The light again is 100 watts in halogen, and the fan comes with a cover for the light. This fan shimmers. It is expensive, but quite a statement piece. Fans will certainly help you with providing you comfort on hot, summer nights. It will also help you with pushing heat down on reverse for winter. So, fans are utilitarian, however stylistically. Please try something other than white. 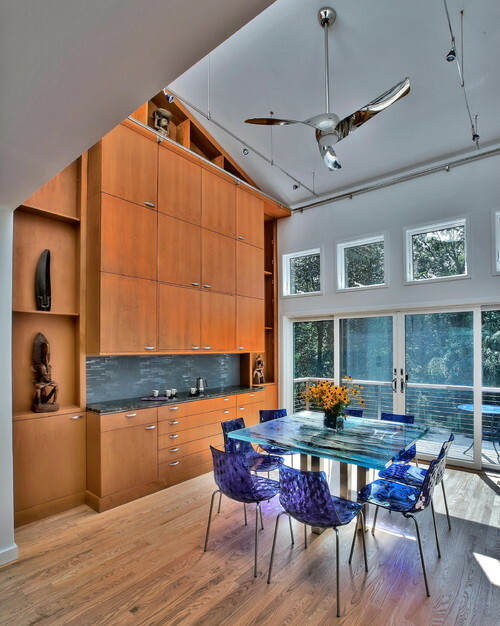 Nickel accentuates your space as a design element. Be bold: Don't hide your fan in white. Want more info on Kitchen Lighting? Get the Yale Kitchen Lighting Buying Guide with articles on how to properly illuminate your space using task, decorative, accent and ambient lighting. Well over 135,000 people have read a Yale Guide.